Motherhood is pretty all-encompassing, isn't it? I don't think a few minutes goes by when I don't think about my kids. I've become used to this notion by now, with a 6 year old and a 4 year old under my roof. One thing that took me a while was to remember that having a family doesn't need to replace our other goals, and I don't just mean our careers. When I had my son, I quit my teaching job to stay home with him. I didn't have any help available, so it made sense that I would be the one to care for him. We had our ups and downs that first year. Then I had my daughter, and again, my life was flooded with childcare-- feeding, diapering, napping-- you know, everything. Image is not me, but it's pretty great! But within that insanely tiring and overwhelming period, I did manage to carve out a tiny bit of time to do one thing for myself: blog. You're reading the fruits of that labor right now. I started Frantic Mama when my son was one, and it slowly transformed my life. Even though only about 3 people (my mom and husband included) read it at first, writing still felt wonderful, and I soon found myself connecting with others about the trials and tribulations of motherhood. It has since led to publishing and a part-time freelance career. Then, when my daughter was two, I carved out a little more time to pursue another passion-- riding. Why not? I realized. Life it short, after all, and I wasn't getting any younger. There was pretty much no reason I couldn't carve out 2 hours a weekend for myself (though, sure, we moms are very good at coming up with a list of 20 things we "must" do). You have to make the time. It was up to me. Though I felt guilty for a while, I stuck with my Saturday riding sessions, and doing so has opened up other doors for me (writing about horses, in particular-- a perfect career fit for me) as well as meeting new people, gaining new skills and experiences, and exercising in an awesome environment. I no longer have to look back and wish I had done it-- because I do it. I wrote about my experience on Parent.co here, and I would love it if you gave it a read. Perhaps my story will even inspire some of you to try something new and to make time for yourself (other than torturing yourself on a treadmill or wandering Target for an hour-- those are not the passions I'm encouraging, ladies! Think bigger!). There is more out there. I hope to keep finding it, and I hope you do too. Hi Julia. I really enjoyed reading this post, especially since it sounds so familiar. I was also a teacher but made the decision to stay home after my third child was born. My oldest is now 21 (which brings a whole new set of stresses) and my youngest is 14. 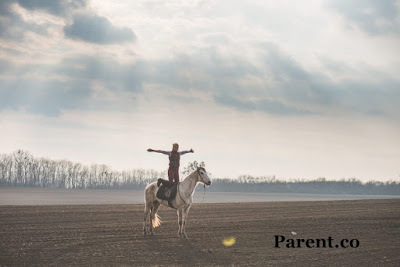 Just like you, I started riding later in life and I am now blogging about my experiences as a new rider. Anyway, I just wanted to say hi and tell you how much I enjoy reading your blog. Have a great day! Thanks so much for writing, Robyn! How cool that you also started riding as an adult-- I am still so glad I bit the bullet and gave it a try. I even did a show this summer! I bet your kids are proud of you. Congrats on starting your blog! I'd love to check it out sometime!